We featured the previous version of the EliteBook Folio, the 9470m, on last year’s list, and it was one of our favourite business Ultrabooks. This year, HP has decided to make the Folio, with the 1040 G1, their top of the range business notebook, since the new EliteBook 840 G1 now takes the 9470m’s place, both feature and price wise. The Folio 1040 G1 has a premium design, and is made from magnesium alloy, and while many of the Ultrabooks in this list are good looking machines, the 1040 is one of the most attractive of all. It is very thin – at 15.9 mm it is the thinnest EliteBook, and one of the thinnest business Ultrabooks on the market. Despite its svelte dimensions, it still passes twelve MIL-STD 810G tests (more than the 840 G1) for drop, vibration and dust resistance – it is a very tough machine like HP’s other EliteBooks. The Folio 1040 G1 is available with either a matte HD+ (1600 x 900) or matte FHD (1920 x 1080) screen. The 1080p screen has a bright IPS panel with excellent viewing angles, however, like the 840 G1, the lower-resolution screen is just a TN panel, so is of considerably lower quality. The 1040 can also be configured with a FHD IPS touchscreen, and this option is not just limited to the top-end i7 model. 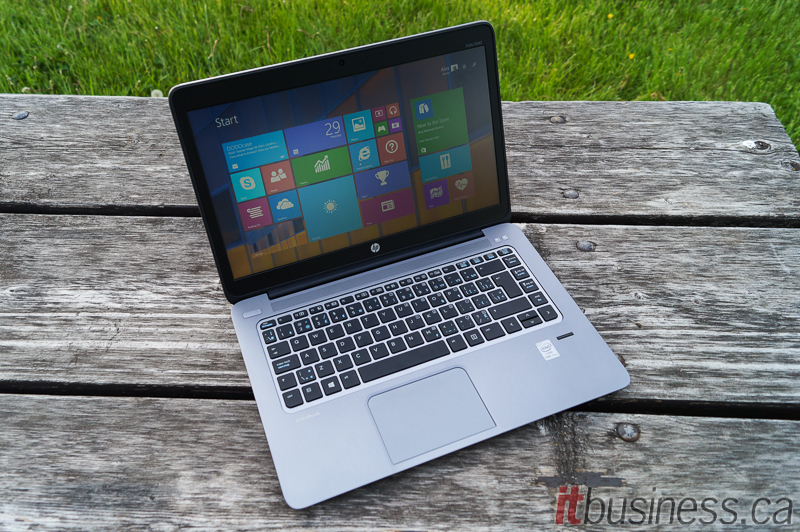 HP also offers a Core-i5 powered Folio 1040 with this display. Unlike many of the Ultrabooks in this list that only come with Intel’s HD 4440 graphics, the 1040 G1 can also be configured (if you get the model with an i7-4650 CPU) with substantially better Intel HD 5000 graphics. Of course, this is still integrated graphics, so machines like the Acer P645 and EliteBook 840 G1 that come with dedicated graphics cards are still going to perform a lot better in 3D graphics intensive tasks. The 1040 G1 can be configured with a variety of different Intel Core series CPUs, all with vPro, apart from the i5-4200U in the base model. The 1040 G1 has a good spill-proof backlit keyboard, and a decent sized touchpad, which uses Synaptic’s new pressure sensitive ForcePad technology that takes a bit of getting used to. There are no physical mouse buttons, and the touchpad itself uses variable pressure detection for different actions, such as controlling how fast you scroll when using a two-finger Windows 8 gesture. The 1040 strangely does not have the option trackpoint mouse pointer that is found on all the other Elitebook models, which is disappointing. Unlike the EliteBook 840 G1, the 1040 G1 has a limited amount of ports, due to the restrictions of its thickness. It has only two USB 3.0 ports, a full-sized DisplayPort for video-out, and a microSD card reader. We would have preferred to see a more practical full-sized SD card reader instead. The 1040 G1 has full docking capabilities, and uses the same UltraSlim dock connector on the side as the EliteBook 840 G1, and all the other current model EliteBooks. By having the docking connector on the side, the Folio 1040 can still have full enterprise docking capabilities without compromising its thickness by having a port on the bottom. It also has a fingerprint & SmartCard reader. 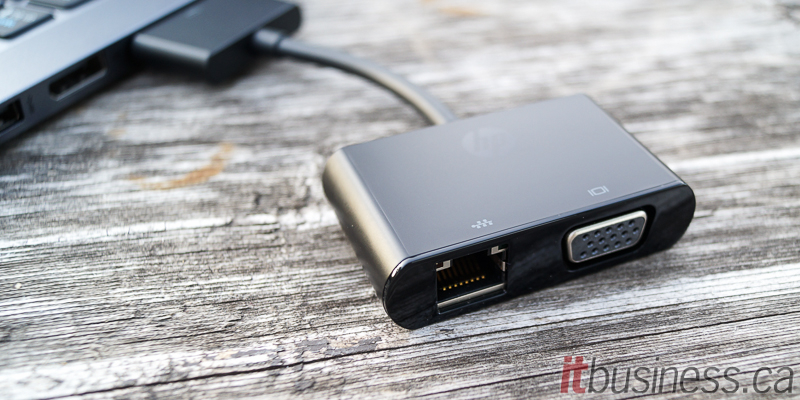 To offset the fact that the Folio has a limited number of on-board ports, HP has included a fairly compact dongle that plugs into the dock connector and adds VGA and Ethernet ports. It is a little frustrating to see that the 1040’s power adapter does not use same standard plug size as other HP business notebooks, which may prove problematic if you lose or leave yours behind and need to borrow a power adaptor. Unlike the EliteBook 840 G1, the 1040 G1 does not give users easy access to its internals for upgrades. It has 4GB of RAM soldered to its motherboard and one DIMM slot, so 12 GB is the maximum amount of RAM possible if you put an 8 GB stick in the slot. In order to access the RAM and SSD, you need to unscrew the bottom of the notebook, something many users will not be comfortable doing. The battery is also non-removable, but thankfully does provide excellent battery-life – the 1040 G1 has been tested to run for up to 8 hours. 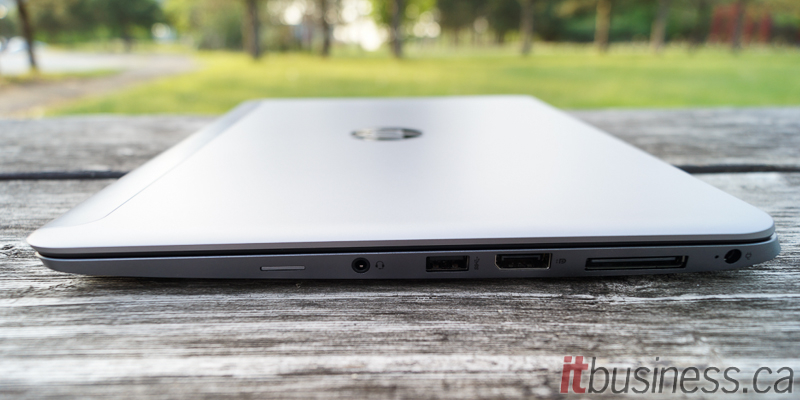 Because the 1040 G1 is HP’s top-end business Ultrabook, it is quite expensive for the features and specifications you get – even the base i5 model is $1440, and it goes up to $2,280 if you max everything out. If you are looking for value for money, there are other choices in this list that are better.